Gregory McKarl Hardy (born July 28, 1988) is a former American football defensive end. He played college football for the University of Mississippi (Ole Miss), and was drafted by the Carolina Panthers in the sixth round of the 2010 NFL Draft. Hardy was named to the Pro Bowl and second-team All-Pro following the 2013 NFL season in which he recorded a career high 15 sacks. Hardy's 15 sacks in 2013 is currently the Carolina Panthers single season franchise record. Hardy also played for the Dallas Cowboys. On July 15, 2014, Hardy was found guilty of assaulting an ex-girlfriend, and sentenced to 18 months probation as well as being suspended for 10 games by the NFL. The charges and suspension were later dropped after the victim failed to appear in court to testify, but Hardy's arrest and trial was the focus of considerable controversy. Hardy attended Briarcrest Christian School in Memphis, Tennessee, where he was a three-sport letterman in football, basketball and track. In football, he helped lead his team to the state championship in 2004. As a senior, he was credited with 65 tackles, including 12 for loss and six sacks, while also receiving 48 passes for 268 yards. Hardy played with offensive tackle Michael Oher at both Briarcrest Christian School and Ole Miss. In basketball, he was an honorable mention All-State as a junior. In track & field, Hardy earned a letter competing as a sprinter and shot putter. In sprints, he ran the 200-meter dash in 24.04 seconds as a sophomore. In the shot put, he got a top-throw of 14.47 meters (47 ft, 2 in). In addition, he also recorded a 4.8-second 40-yard dash and had a 28-inch vertical jump. Hardy was considered a three-star prospect by Rivals.com, and was ranked No. 30 among weakside defensive end prospects, No. 44 according to Scout.com. He was an All-State pick who was rated as the No. 5 player in Tennessee by Super Prep, No. 8 by Scout.com and No. 12 by Rivals.com. He was also named All-Metro by The Commercial Appeal. Hardy was considered one of the best pass rushers eligible for the 2009 NFL Draft but he elected to return to Ole Miss for a senior season. He underwent surgery on a broken bone in his right foot during the off-season but was ready for the 2009 season. Hardy had 38.5 career tackles for loss and 26.5 sacks, which included a best in the SEC 10.0 sacks in 2007. In April 2009 Sports Illustrated, Hardy was named the top prospect for the 2010 NFL Draft. However injuries, poor production, and an unimpressive combine, caused his draft stock to fall significantly. Hardy was selected by the Carolina Panthers in the sixth round (175th overall) of the 2010 NFL Draft. He was signed to a contract on June 17, 2010. Hardy managed to record a blocked punt for a safety as well as force a fumble and record 4 tackles in his rookie debut. Although Hardy had played in 15 games his rookie year, he had started none. He did however, finish the year with 30 tackles, 3 sacks, two forced fumbles, and the aforementioned safety. Hardy recorded 11 sacks in 2012 in spite of sustaining a broken thumb in September. On November 9, 2012, Hardy was fined $15,750 for a roughing the passer penalty against Robert Griffin III versus the Washington Redskins in Week 9. On June 11, 2013, Hardy spoke to reporters during a summer minicamp claiming his goal for sacks in the 2013 season to be 50. Regarding such a lofty number, more than twice the current record, Hardy stated, "Why shoot low, right? If I'm going to shoot at it, I'm going to shoot at it with a 50 caliber. I'm going to shoot at a little bird with a 50-caliber bullet. That's the goal for this year, 50 sacks, that's where I'm at. That's the goal, 50. You heard it first." In a road victory against the Atlanta Falcons, Hardy finished with a single game team record four sacks. He ended up recording a team-record 15 sacks, earning his first trip to the 2014 Pro Bowl and being named a second-team All Pro by the Associated Press. The Panthers defense finished first in the NFL with 60 sacks in 2013, second in points per game, and third in DVOA team defense. He was ranked 53rd in the NFL Top 100 for his breakout performance in the 2013 NFL Season. Hardy was set to become a free agent during the 2014 offseason, but it was announced on February 28, 2014 that the Panthers had placed the franchise tag on him, allowing him to return to the field for them during the 2014 season. Hardy played the first game of the 2014 season, but was placed on the commissioner's exempt list while his domestic violence case played out. He remained there for the rest of the season. In March 2015, the Panthers decided not to re-sign Hardy. Panthers owner Jerry Richardson, who almost never intervenes in football matters, made the decision to cut ties with Hardy. Despite requests from players and coaches to let Hardy have another chance, Richardson said that he made the decision not to do so because "we do the right things." On March 18, 2015, Hardy signed as a free agent a one-year, $11.3 million contract with the Dallas Cowboys. The Cowboys were looking for him to be a difference-maker at right defensive end and as expected, were criticized by the public and the media for the signing. On April 22, Hardy was suspended for the first 10 games of the 2015 season without pay due to violating the NFL Personal Conduct Policy. On July 10, the NFL reduced it to a 4-game suspension, in order to avoid a possible legal action on Hardy's part. His first game after the suspension came against the New England Patriots. He had a strong performance in the first half with two sacks and five hits on quarterback Tom Brady, but was mostly contained in the second half, after the Patriots made a series of offensive adjustments. Against the Seattle Seahawks, he tipped a pass from Russell Wilson and intercepted it. After his quick start, although he played with a high effort, he struggled with his technique and his production dropped. He finished as the team leader in quarterback pressures (32) and was second on the team in sacks (6), with only three coming in the last nine games. Hardy also drew the ire of coach Jason Garrett due to inappropriate tweets, frequent tardiness as well as being an bad influence to the younger players on the team. He was not re-signed after the season. In October 2016, he announced he would start an MMA career and was training for several months, although he had no previous experience in mixed martial arts. On May 13, 2014, Hardy was arrested for assault and communicating threats, after he was alleged to have assaulted an ex-girlfriend by grabbing her, throwing her into furniture, strangling her, and threatening to kill her. On July 15, a judge found him guilty of assaulting a female and communicating threats, and sentenced him to 18 months probation, suspending a 60-day jail sentence. When Hardy appealed the decision, requesting a jury trial, the victim failed to appear in court to testify. As a result, the prosecutor's office dropped the charges, citing their inability to locate the victim, and "reliable information" that the two parties had reached a civil settlement. Hardy's arrest and trial was the focus of considerable controversy, as news media drew comparisons to other NFL-related domestic violence cases, including those against other NFL players. Panthers coach Ron Rivera initially told news media that he was comfortable having Hardy play, but on September 14, 2014, Hardy was deactivated. On September 17, 2014, he was placed on the exempt list by the league, which meant that he could continue to draw his salary but was prohibited in taking part in any team activities. He would never play another game for the Panthers. On April 22, 2015, NFL Commissioner Roger Goodell suspended Hardy for 10 games, after the league's two-month long investigation found that there was "sufficient credible evidence" that Hardy had engaged in conduct which "violated NFL policies in multiple respects and with aggravating circumstances." The league's investigation had concluded that Hardy used physical force in at least four instances, including placing his hands around the victim's neck with enough pressure to leave visible marks, and that his actions were "a significant act of violence in violation of the Personal Conduct Policy." On July 10, 2015, an arbiter reduced Hardy's suspension from 10 games to four games. On November 5, 2015, the domestic violence charges against Hardy were expunged from his record. The following day, Deadspin released police photographs of Hardy's ex-girlfriend's injuries. On September 26, 2016, Hardy was arrested for cocaine possession in Dallas, Texas. ↑ "Panthers' Greg Hardy found guilty on 2 counts of domestic...". wsoctv.com. ↑ "Panthers deactivate DE Greg Hardy vs. Lions". CBSSports.com. 1 2 3 4 Sean Gregory (September 11, 2014). "Greg Hardy, the Convicted Domestic Abuser Who's Still in the NFL". Time. ↑ "Weakside defensive ends 2006". Rivals.com. 2006-01-30. Retrieved 2009-04-29. ↑ "Defensive End Greg Hardy Returning to School". ESPN. January 15, 2009. 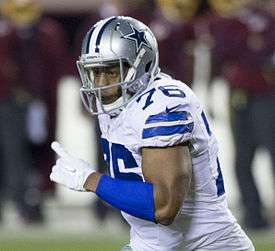 ↑ "Greg Hardy Undergoes Successful Foot Surgery". SI.com. January 22, 2009. Archived from the original on January 27, 2009. ↑ "Greg Hardy - Mississippi, DE : 2010 NFL Draft Scout Player Profile". nfldraftscout.com. ↑ "Greg Hardy, Taylor Mays are top 2010 NFL Draft prospects". Sports Illustrated. April 28, 2009. Archived from the original on April 30, 2009. ↑ "DE Hardy, S Pugh, CB McClain signed". panthers.com. June 17, 2010. Retrieved 2010-06-17. ↑ "Greg Hardy". kffl.com. September 25, 2012. Archived from the original on September 19, 2011. Retrieved 2013-04-09. ↑ "Fines roundup: Michael Vick of Eagles docked for low block". National Football League. 2012-11-09. Retrieved 2012-11-09. ↑ "Greg Hardy targets 50 sacks in '13". ESPN.com. June 11, 2013. Retrieved 2014-01-21. ↑ Newton, David. "Greg Hardy gets franchise tag". ESPN.com. Retrieved 28 February 2014. ↑ Newton, David (2015-03-23). "Owner says he let Greg Hardy leave". ESPN. ↑ Tyler Conway. "Greg Hardy to Cowboys: Latest Contract Details, Comments and Reaction". Bleacher Report. ↑ Kay, Stanley (April 22, 2015). "NFL Suspends Cowboys Player Greg Hardy for 10 Games". Time.com. Retrieved April 22, 2015. ↑ Florio, Mike (April 22, 2015). "NFL suspends Greg Hardy 10 games". Pro Football Talk. Retrieved April 22, 2015. ↑ Helwani, Ariel (11 October 2016). "Former Dallas Cowboy Greg Hardy transitioning to MMA, preparing for debut". MMAFighting.com. Retrieved 11 October 2016. ↑ "Panthers' DE Hardy released from jail on $17K bond". WSOC TV. ↑ "Panthers' Greg Hardy found guilty on 2 counts of domestic...". WSOC TV. ↑ WBTV Web Staff (9 February 2015). "Panthers: No change in Greg Hardy status after charges dismissed". WBTV. 1 2 3 4 "A look back at Cowboys DE Greg Hardy's tumultuous timeline". Dallas Morning News. ↑ Wilson, Ryan (September 14, 2014). "Panthers deactivate DE Greg Hardy vs. Lions". CBSSports.com. Retrieved September 14, 2014. ↑ Chiari, Mike. "Greg Hardy's Domestic Violence-Related Charges Expunged from Criminal Record". Bleacher Report. Retrieved 5 November 2015. ↑ Mosgovitz, Diana. "This Is Why NFL Star Greg Hardy Was Arrested For Assaulting His Ex-Girlfriend". Deadspin. Retrieved November 6, 2015. ↑ "Free-agent DE Greg Hardy arrested on cocaine charge". ESPN. Retrieved September 27, 2016.